When trying to speed up blooming on a seedling, does the rootstock make a difference? Re: Precocious Poncirus, Flying Dragon, Standard Poncirus, or mature citrus? There are various methods to induce blooming, many not publicly shared. From my point of view the answer is yes to some extent and no as a general rule. Strong rootstock will assure a rapid growth, resulting eventually in a quicker maturation. 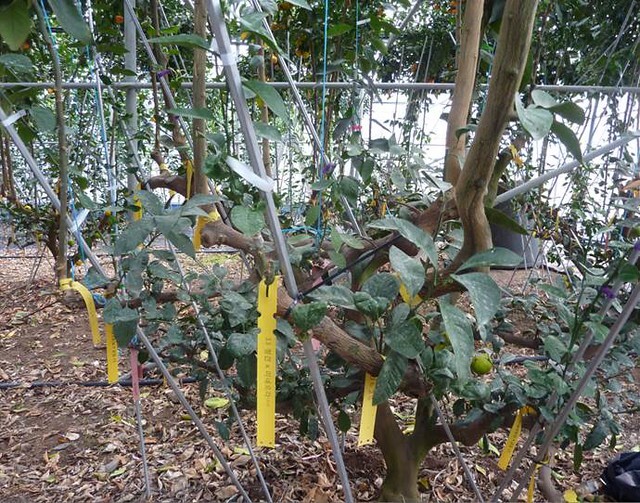 In Florida seedlings have been trained to grow upright supported by a pipe framework, lateral branches are pruned off. At 3.3 meters there is 90 degree horizontal turn and the apical leader is trained to follow it. Flowering has been induced in as little as 2 years using this method. Obviously Florida has a very favorable climate that might be difficult to replicate. Is there a report about this method somewhere to find? I guess it is not possible to have 3,3m growth within 2 years in northern german climate. So that's not certain Ilya. A pear scion grafting on pear seedling takes longer than the same pear tree on quince tree. To have fruit faster it is well known that it is necessary to use PG dwarfing is coming from cuttings. Also you leave a seedling and you want to make fruit faster. 1) So I would use an adult tree to graft my scions ( because mature ) . 2) Or mature Poncirus cuttings. If you use a vigorous PG from seedling I think you'll wait a long time and it's pretty normal because the Scion is not mature and the PG also is not old enough to give fruit. However it will not be vigorous according to the choice of citrus. Bending a branch too vigorous, the movement of the SAP is slowed down, and it is forced to give fruit earlier and to take less strongly into sterile shoots. This operation is applicable to all fruit trees. My recollection is that Fredrick Gmitter at Lake Aldred FL USA was the scientist that used this technique in the effort to develop resistance to HLB. I will try to find the article, it may have been in the" Citrus Industry". This is a Japanese method. Not much information in English. We discussed about this last year here. One thing I found is the use of very old pt interstock which makes the tree dwarf and maybe induce flowering. Of course there are also hormones who van be used. Thanks Kumin, viewing the details makes it the method clearer. Dr. Gmitter may have been the researcher who gave a talk at the Southeast Citrus meeting in November. First of all, it is not about pears, but citruses. Quite a different biology. Second, we are discussing methods for breaking juvenility in seedlings, not of bringing rapid fruiting in plants grafted by already mature wood. Maturity of poncirus rootstock has no influence on juvenility of grafted immature seedlings, although a large satsuma interstock can accelerate flowering. In citruses, the moment when a wood is committed to flowering depends on the overall size of the plant ( some believe that it is a number of nodes from the ground that serves as a proxy). After this state is reached the methods that interfere with gibberellin /auxin ratios like bending, girdling, stressing by drought or the use of chemical retardants can be used for flower induction. Grafting of immature seedling on the strong rootstock permits a rapid growth to achieve the critical size of the plant. For the majority of citruses it is 2-3 m high. To achieve it more rapidly, one could initially suppress the size branches but to keep them at maximal height. Japanese scientists are using strong shiikuwasha seedling rootstock to achieve early flowering in around 2 year time. From my own experience the grafting on a strong 5star citrumelo results in flowering after 3 years. A mature pt interstock can induce flowering in the same way c. Depressa rootstock does. It also makes the tree dwarf, so the hight doesn't need to be 3m. The results are the same with satsuma seedling rootstock, just operationally it is more convenient to use strong classical satsumas grafted as interstock on poncirus. a picture of grafted immature hybrids on strong rootstocks in S.Korea.